Take our NY SEE THE LIGHTS! 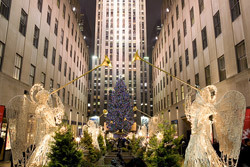 Tour between November 30 and January 5, and see the holiday lights of New York City. We’ll show you Christmas window displays at several of New York’s top stores, including FAO Schwartz, Lord & Taylor, and the top stores on 5th Avenue. You’ll also see Macy’s Department Store, home of the Macy’s Thanksgiving Day Parade, and the other shops at Herald Square. Lady Gaga is decorating windows at Barney’s this year, so they are sure to be spectacular. We’ll take you to see the extravagance. Drive through Central Park and see the Central Park Zoo. 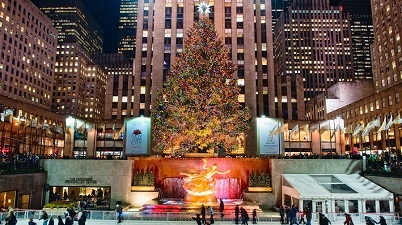 Drive by Rockefeller Center and see New York City’s most famous Christmas Tree. 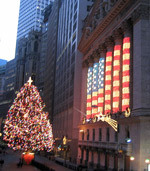 The Christmas tree that adorns Rockefeller Center is typically a Norway Spruce, and the one chose is usually between 75 and 90 feet tall and proportionally wide. The tree is donated by someone who grew it in their yard. The people who donate the tree don’t get paid for it, but they have the pride of knowing that their tree will be displayed before the world. The Rockefeller Center tree is decorated with over five miles of lights. Plan to go back and visit the tree after your tour. Rockefeller Center is too crowded for our tour to stop there, but you will see it from the bus. Tickets are $79.99 per person. 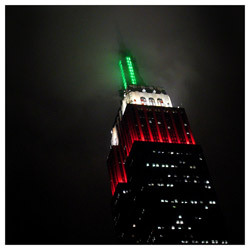 The tour leaves from 50th Street & 7th Avenue at 7:00pm nightly from November 30 through January 5. 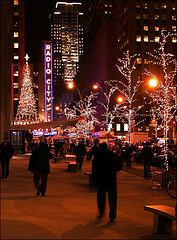 Get information about what to do in New York City during the Holidays here.